SOA trip was one of the most exceptional experiences for me. I learned a lot from this trip. I get to experience situation that I never thought I would have to before. I get to visit my neighbor country, Vietnam, which amazed me by all the culture and nature. For me I think Vietnam is different from Thailand in many aspects and to be able to experience new culture new environment is really the reason why this trip was such a good experience. Before I came to Vietnam I had study a little about its history about the war and political side of Vietnam but as I had a chance to visit the country I get to know about the culture and reality of Vietnam in present day. Vietnam has preserved its beautiful nature and their traditional lifestyle so when I was there I feel totally different vibe from when I was in Thailand. It was a perfect get away trip for big city like Bangkok. On the first day we went on a bamboo boat which paddle by Vietnamese lady, the scenery was gorgeous, the weather was so nice and the Vietnamese lady was nice to us even she barely speak English. But that was just before I realize that it was not just that Vietnamese lady that cannot speak English. I think on the first day we become to realize that three groups of student were not speaking the same language. The communication problem start to get in the way of getting to know each other since the first day and that concerned me of how are we going to do for the rest of the trip. The activities on the second day were really useful for this trip. It taught us how to communicate with out the language. It brings out the ability that we don’t even know we have. It is to use hand gesture, picture, acting; anything but words. And from that we can apply things we learned to our daily life for the rest of the trip. I think those activities were great and they help broke the ice between students and learned about one another. At first I thought the communication problem will cause the whole trip but in contrast it brings us together even more. We learned that we had problems so we try even harder to get along and eventually we all became friend. I was not the kind of person who talks a lot to stranger and with the different language made it harder for me to break the ice with someone. Vietnamese students showed me that language was not the problem. I admire them for their effort. My first roommate was Anh, she can speak English very well and very nice girl. I was so lucky to have her as my first roommate. But Ngoc was the girl that impressed me the most. She has trouble speaking English but she never stops trying, she uses all the help from Google and turns the situation all around. From then, language was not the problem between us anymore. With Japanese students, I have less communication problem with them than Vietnamese so we can get along faster. During 9 days trip I eventually get to know more about both Japanese and Vietnamese students. Time went so fast when we started to get so close. When the last day comes, I almost cannot believe that I have to say good bye to all my new friends so soon and I wish there will be a chance for us to meet again. What I learned most about this trip is the power of open mind. If we have open mind we can do anything, it is all about our attitude toward the situation. There is no bad situation, it is just only different. We can overcome any different situation with our open mind. To become friend, we don’t need to speak same language or come from same culture; all we need is our heart and our hand. If we can’t speak, use our body to explain it. In the end we all became good friend, we had fun trip together. We share the same experience that we will cherish it forever. I think listening is the most important part. SOA trip has always impressed me since the first time I joined 2 years ago. This year I was very glad to have the chance again. Trip in Vietnam was a very good trip. It was great that we had a tour guide who knew the history quite well and could explain to us very clear. As a political science student, I am very interested in history and Vietnam is a country that has a very interesting history. It is impressive how fast Vietnam can recover and develop after decades devastated by so many wars. Also, it was the first time I had a chance to visit a socialist country, so I learned many things that I haven't known before. What I feel about Vietnam is that it is a very calm country and has very beautiful nature. People still live very simply, unlike Thailand which is a very materialistic society. For 9 days, I think it was a really good trip. It was enough time for students to get to know each other and gain a lot of precious experiences. I think some students already attached to one another a lot. We can see it evidently from those tears at the last day of saying goodbye. About the trip participants, I'm very impressed with both Japanese and Vietnamese. Japanese friends are very outgoing. I feel so happy when talking to them. They try to make friends with both Thai and Vietnamese. Vietnamese, personally I feel that they like to talk with Japanese more than Thai. But I understand that they can not communicate with English very well and they are more comfortable speaking Japanese. So I try to speak slowly and try to use body languages to help sometimes. I know it is difficult to communicate with people who speak different languages than us but I don't think that it is too difficult if we have an open mind and open heart that ready to listen and ready to understand. Anyway Vietnamese are very nice, I really like them, they look so young and very sincere. And this is the first time I have friends from Vietnam. By the end of the trip Vietnamese gained more confidence and came to talk more to Thai students. I was very impressed how hard they try to communicate with Thai students. Some could not speak English very well but they used computer to translate and write it in letter for Thai students. What I like about this trip is that we have to switch room mate every time we move to the new hotel. It is a very good way for students to meet and talk more with new friends. I also like the seminar that we played many of the cross culture training games. Last time in Thailand I already knew how to play those games but when I had a chance to play it again, I understood the games more clearly. It was a very clever way of ice breaking, break up groups students or separate students. It was very fun and also each game gave us lessons. What I learned from SOA trip, both Thailand and Vietnam, is that being with people from different culture and speak different languages is not easy, especially this trip that language is the biggest obstacle. This barrier would not be disappear if all of us didn't make a hard effort to break it. So I learned that if we have an open mind, ready to understand, ready to listen, ready to look over bad feelings and keep only good ones, we can get over whatever we think that it is impossible. I think listening is the most important part. Listen without criticizing, listen with an open mind, listen from whoever is talking to us with respect is very important. I know everybody love to talk, love to share what they have been through or what they have experience in their lives, but if nobody listen that means nothing. As I say at the beginning that speaking different languages is an important obstacle for us to become friends and understand each other, but if we all listen very carefully and listen with respect, I believe that we can understand each other very well. We might not be able to understand every words, but the expression on their faces and some body languages will make it easier if we listen to our friends earnestly. Therefore speaking different languages is not that big of a problem. Finally, I would like thank you Mr. Hatano and Mr. Yahiro who always take a good care of us. Thank you for the most memorable trip. Thank you for giving us all a chance to meet each other so we can become very good friends. I love Mr. Hatono's words that “ Friendship is really important, it can help your life.” I believe that it's true. Friendship is very important. Friends will be the one who walk beside you in the road of your life no matter how rough that road is. They will always be there to help and support you. At least, they are the most important laughter in your life. SOA Tour to Vietnam is the great program. I am so glad that i have a chance to be apart of this program. Nine days in Vietnam give me a lot. Many good experiences happen in there. Culture , History, Famous Places ,Different Food, Friendship, Great People. etw. It's good to have new friends with other people from other countries. Its good to share the moment together. Even if we dont speak the same langauge. It is very impressed that we all can help eachother to go over the language obstacle. This trip teach me many things to adjust my attitude in a better way. It makes me know that we can be happy together within the differences of our own. It is very important in the social nowadays. We all have to be open minded open for new different things, new people,new culture. In oder to understand eachother and be happy in every way. I have to thank you for a great opportunity from Mr.Hatano and Mr.Yahiro to join Sing Out Asia Trip 2013 in Vietnam. It was a great trip with lots of good memories in Vietnam and it brings me a great relationship with new friends both with Japanese and Vietnamese students. The time, the memories and the friendship is the most value I've got from this trip, which all of this couldn't bought by money. This trip would have been my last chance to join Sing Out Asia Trip around Asia, before I have to go back to my real life and I have to pursue on my future career. I have a good time with all my new friends in this trip and I will keep our friendship forever. I wish to see them all again in the future, may be in Vietnam or Japan or Thailand. My name is Pronprom Sripathom, a student from Thailand. 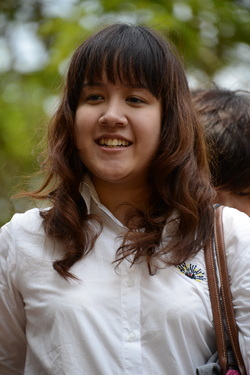 I’m studying in Chulalongkorn Universty, faculty of Political Science, major in International Relations. Sing Out Asia cross cultural training camp in 2013 in Vietnam was a second time for me in being a participant of this program. From the first time in Thailand in 2011, I had joined this trip just because I want to travel around. But after few days spending time with many friends from Japan, Malaysia and Indonesia, I had learnt many things from them. I knew more about other counties, about their cultures, histories, foods and I learned some words from them. In 2011, I just finished the first year in university, and SOA had opened my eyes to see the world and people outside my country, to learn and to care more about others. SOA trip completely changed my life, my thought and my attitude. I had learnt more about how to blend in with other people from different countries, cultures and backgrounds. So, this camp gave me a remarkable experience. On the last day of 2011 camp, I was crying a lot because I had to say goodbye to my friends, I never thought that 9-day camp will let me feel so close to them this much. Personally, I don’t like saying goodbye because I think that it’s not easy to see them again, I thought this goodbye means forever. I tried to keep in touch with them on Facebook and Skype which make me feel so close with them. And some of my friends came to visit me in Thailand which made me feel so happy to see them again. I learn that goodbye doesn’t mean that we will never see each other ever again but it’s just only a moment. Even I didn’t meet everyone after the camp but two things remained which are friendship and memories that keep us together. 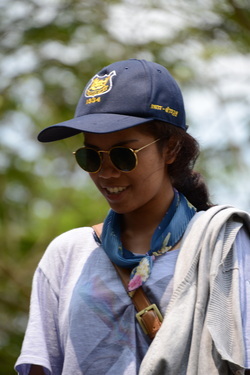 After the camp in 2011, I tried to improve my English and I really want to join the SOA trip again in 2012, unfortunately, Thailand was faced a big flooding, my school had to be postponed and not finished in time when the trip began. So, in 2013, I heard that this year will have SOA trip in Vietnam, I was really interesting because I was impressed from the first trip in 2011 and another reason was I just studied about Vietnam history. Thus, I decided to join the trip again. In this trip, I got new friends from Vietnam, Japan and even Thailand. We were having fun together, knowing about each other through many games which gave very useful lesson in living with other people. There were many games, for example one game, we were told to find a partner and after that we have to learn about each other without talking or writing, we can use only body language. This game taught me that even we are using languages but it doesn’t mean that we can’t know more about each other by only using speaking language; we can use other means in communicating. Another game I like name ‘Beta and Alpha ’, all students were dived into 2 groups, one belong to Beta and another one belong to Alpha village. Both villages have their own characteristics, languages, with completely difference norms and values but they don’t know about each other before. Beta and Alpha have to send their people to visit another village to observe what people in another village are doing, how they greeting, how they living. After the game, we had a discussion about what we think or learn when visit another village. Lessons learnt in this game were very useful. Things I learned from this game is when we go to other countries/places, we have to observe and learn about other societies, we can’t act like we are being center of the world but sometimes we have to follow others, follow their rules and their cultures. To sum up about SOA cross cultural training program, this program taught me lots of things, shaped my attitude toward others. The trip gave way of thinking in term of international dimension which really important to me as an international relations student. In this trip, I had a little bit worried about relationship between Thai and Vietnamese students. Because many times I tried to make friend with some Vietnamese students, I talked with them but many of them didn’t talk back and they just walked away without saying anything with me and they always stick together with the Japanese students, talking in Japanese a lot which I don’t understand. I started to worry and I think that maybe the Vietnamese students wanted to speak Japanese and talk with the Japanese more because they are major in Japan Study. They like Japanese comics, foods and cultures. So, I think they have no idea about what to talk with Thai students. After few days, I decided to talk with my Vietnamese roommate about what I worried. I talked with her because she had been so nice to me and talked with me a lot when we stayed together and I don’t want to keep my worries for any longer. We were talking about what I worried. I asked my roommate that if any Thai students did anything they don’t like or they just want to practice their Japanese. The answer I got from my roommate is completely different from what I think at first. She said that actually Vietnamese students really want to talk with Thai students but they have no confidence to speak English because they studied English just to pass exam but they never have a chance to use it. They thought that they will say something wrong and Thai students might not understand it. Then they just avoid speaking English and just ignore when someone talked with them in English. So, I told my roommate to tell their friends that they don’t have to care about grammar or whatever, just say it, I don’t care if it right or wrong. We are all friends, not teacher and students. So, we have no need to say everything grammatically corrected. We were talking for an hour. The next day, I think my roommate had already told their friends about our conversation. In the afternoon, I noticed that many Vietnamese students came to me and tried to talk with me and other Thai Students more than few days ago. I was very happy to talk with them , I asked them a lot about their politics and history that I’m interested. Because before I went to Vietnam, I had studied about Vietnam history. So, I took this chance to visit and learn more about the history, politics and social directly from the Vietnamese. The trip nearly came to the end, we had farewell party before went back to Hanoi. Almost everyone said about the trip, about what they got or what they learn from the trip. Many people were crying a lot when we knew that we about to say goodbye. Finally the last day came, we have to say goodbye, we were crying a lot again and even more than in farewell party. We promise to each other that we will keep in touch and we would find every possible chance to meet again. Some of my Japanese friends said they will save money and come to Thailand on this coming August. I felt so glad to hear that. And I started to miss them every time I saw our pictures that keep all good memories inside. I’m counting days to meet them again, I think it will be awesome as it was. I know how good it will be when you meet people you hardly meet. It will be like when I went to Japan on 2012 to meet my SOA friends in 2011, we were talking about good old days and having fun together. So, I think that if I meet my SOA friends in 2013 again, it will be so nice too. As I mentioned that this trip gave lots of experience and have a great impact in my life. And this trip made me realize that one of the most important things in my life is friendship. I deeply appreciated to Mr.Hatano who always give me good opportunities, good experiences. I feel so thankful for everything and everyone that brings me here to meet them. I have been to on many trips and have travel to many places but there is not any trip that can compare to Sing Out Asia Vietnam. The memories and friendships that I have made here will last for a lifetime. It is definitely my most memorable trip. I learned about Sing Out Asia Vietnam through a friend of mine. He invited me to come and after thinking about it I decided it would be a great idea to come because I have never been to Vietnam before. When I first arrived at the airport in Hanoi I was quite anxious because I did not know what to expect. We all met at the airport (Japanese, Thai, Vietnamese) but we started getting to know each other on the bus. Before arriving in Vietnam, I thought that we might have some trouble communicating because we spoke different languages but after I got to talk to some of the Japanese I felt that we would have no trouble communicating in English. I did not know that the majority of the Vietnamese could not really speak English until I got to room with one of the Vietnamese girls. When she told me that she could not really understand English, I was quite worried because I had no idea how we would talk to each other and I really wanted to get to know her. First, I thought if I spoke really slow she might understand me but she still could not but after trying we found out that we could communicate by our body language and by drawing. This was the first time that I was in a situation that I almost could not communicate with somebody because I always thought that everybody could understand English. Everybody might not have great English skills but we could still communicate by using English. So I was quite shocked when I found out that the Vietnamese could speak Japanese so fluently but could not speak English. Being put into this kind of situation taught me that sometime you do not need to use language to communicate with somebody. You could use drawings, body language and you will be able to communicate just fine. This trip taught me a lot of things. I learned that there are many ways to communicate other than using language. I also learned that even though we come from different places and use different languages, we all have similar interest in a lot of things such as music, hobbies and our goals in life. Now the trip is over but those 10 amazing and wonderful days will always live on in my memory. I am very grateful that I got this opportunity to go to Vietnam. I definitely want to come back to Vietnam someday and I am finding an opportunity to go to Japan! I really want to thanks Mr.Hatano and Mr.Yahiro for giving me this opportunity to broaden my horizon, to meet new people and to gain many new experiences. The friendships that have been built on this trip will last forever and I believe that we will all have the chance to meet up again. This trip did not only give me great memories but I gained a family out of it. Now I have two families, one family is blood related and the other is international. I believe that we were destined to meet so that we could share this 10 day journey together. I feel very blessed. As a senior student at Chulalongkorn University, I looked for a chance to have a rest before getting into the job market. By destiny, my friend (Pear) invited me to join Sing Out Asia 2013 which held from 10-19 of March 2013 in Vietnam. This is one of the most memorable experiences and I am very happy that I was a part of this wonderful trip. In this trip, there are students from three difference nations; namely, Japan, Vietnam and Thailand. Once I was there I faced the problem of communication in English. At first, I really panic of how to do with this problem. My first friend is a Japanese guy, name Koki. He is not that talkative, but after chatting with him for a while I found that he is very nice and have many experiences. I am very excited when I heard that he was just back from Fiji. We also have a chance to do group activities together and I have more opportunities to make more friends from this. Every activity was very creative and allowed me to develop my mind-set. One of the most memorable ones was the game that there are a large number of tasks and the one who could finish it first will get the prizes. Actually, there is nothing to do with this game if you read carefully. I was pretty shock when I figured out the problem, may be the last one, but this teaches me not to do everything in order by not check the overall method. Along the trip, I got in touch with more and more friends. Starting with Japanese friends, I get to know Haruna and really feel that she is very smart and very friendly. Shoko looks very eligant. For me she is a real model of Japanese girl. Her English is very good and I am pretty sure that she will be one of the best cabin crew for Japan Airlines. Marie is the cutest girl for this trip. Her gesture when she speaking is amazing. Kana is very talkative and funny girl. 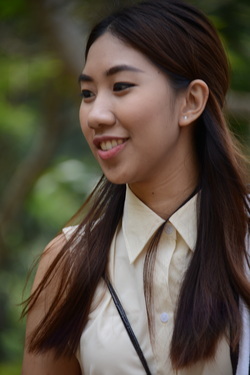 Actually, I really like the way she shows up as it’s really like Thai people. Kota is also very funny guy. With him and Kana, I laughed and laughed many times. I also like his passion and vision about his career path as a teacher. Kong is also very friendly and I am really impressed when he tries to communicate with me. He even used a dictionary and for me I am very appreciates with this. Move to Vietnamese friends, to be truthful, I haven't talk much in detail with them at first. May be this was because of language barrier. However, every times I chatted with them, I was attract by their smile which similar to Thai people. I would love to say more about Moss, as she was the first one I have a chance to chat with her for a long time. 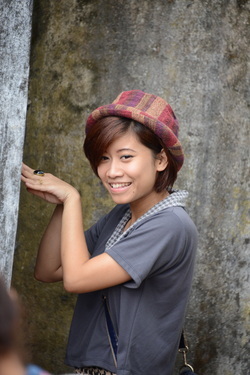 She is a novel and have her own web blog which she translate the novel into Vietnam language. She is also able to perform Japanese style dance. Yuki is the one who I can feel that she really try hard to communicate in English. 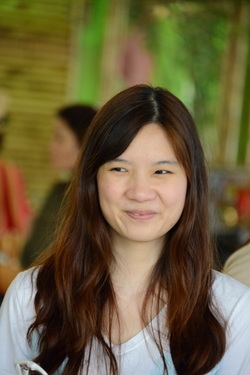 Nguyen is very friendly and she is the leader of Vietnam group. She can speak English quite well. 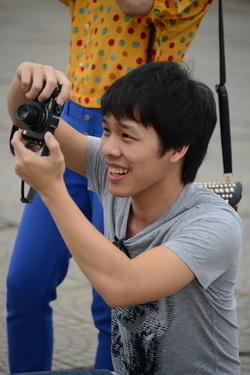 Bin is only Vietnamese guy in this trip, he is very nice too. Lastly are Thai friends, as we come from two difference faculties. I am very happy when we worked as a group for talent show and for me it is very lucky to be friends with them. All in all, I would like to say sorry that I cannot mention everyone here, but I really member everyone. I would like to say “Thank you so much” to Mr.Hatano and Mr.Yahiro for organized this wonderful trip, which allow me to exchange and share my vision, experiences and learn both Japanese and Vietnamese culture and lifestyle. Everything including food, transportation, activity, accommodation, and travel plan is fantastic. Once before I was a part of Sing Out Asia, I feel that when communicate in English I have to pronounce the best accent and use some technical words to look clever. After this trip, I realize that when communicate with friends, there is no need to do that because you really need to let them understand what you talking about. It is like talking through your heart not that special thing that created from your brain. I hope that this program will continue forever, to give a chance for more and more students from around the world to enjoy this great experience like me.